Computer Cable Store is adding a 16-foot long USB 3.0 extension cable to its selection of products, which will enable its customers to connect their devices are longer distances than otherwise possible. 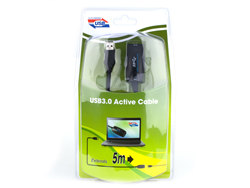 Computer Cable Store is pleased to announce that it is now selling the Networx USB 3.0 Active Extension Cable. Like its name suggests, this cable lets the user connect devices over an incredible distance. However, there are other reasons to recommend the product as well. For starters, the USB 3.0 standard is a significant improvement over its predecessor because it has more speed, more bandwidth, and better power management. However, it is compatible with connectors that use the USB 2.0 standard, meaning that this cable can still be used with older devices. Better still, it can be used to connect older devices with newer devices that are incompatible with the USB 2.0 standard, making it not just a convenience but also a necessity under certain circumstances. With that said, it is important to note the rest of this cable's characteristics. For example, its use of the USB 3.0 standard and its outstanding design enable it to transfer up to 5 Gb per second, which should come as welcome news to all those who have ever fumed while their files were transferring. Furthermore, each 16-foot long cable can be connected to another 16-foot long cable, meaning that the user should have no problems connecting the devices of their choosing regardless of the devices involved in the process. Since the Networx USB 3.0 Active Extension Cable repeats the signal as it is transmitted through its length, it can retain its incredible speed even when connected in such a manner. Summed up, it is clear that the Networx USB 3.0 Active Extension Cable is an excellent addition to Computer Cable Store's selection of products, offering outstanding performance with no rivals on the market while remaining as simple to use as possible. By adding this and other products of use, Computer Cable Store strives to continue providing its customers with the perfect solutions for their cabling problems, thus enabling excellent connectivity in exchange for fair and reasonable prices. Computer Cable Store is an online retailer that specializes in computer cables and other connectivity solutions. By combining expertise with experience, it ensures that its customers are never left wanting, thus providing maximum value for their precious time as well as their hard-earned money.